Tuesday 31st December 2013 – 8.20pm – Claire Brown. A pedestrian has been seriously injured in a road traffic collision in Staffordshire earlier this evening. West Midlands Ambulance Service was called to Hednesford Road in Rugeley shortly after 5.30pm today (Tuesday). The Midlands Air Ambulance aircrew from Cosford, with a MERIT trauma doctor on board, attended the scene in a car together with an ambulance and a responder paramedic. A West Midlands Ambulance Service spokeswoman said: “An off duty paramedic, who had come across the incident and stopped to help, was on scene when crews arrived providing initial treatment to a man, a pedestrian, who had been seriously injured after reportedly being in collision with a vehicle. “The pedestrian, a man believed to be in his 60s, sustained a chest injury as well as suspected pelvis and lower limb injuries. 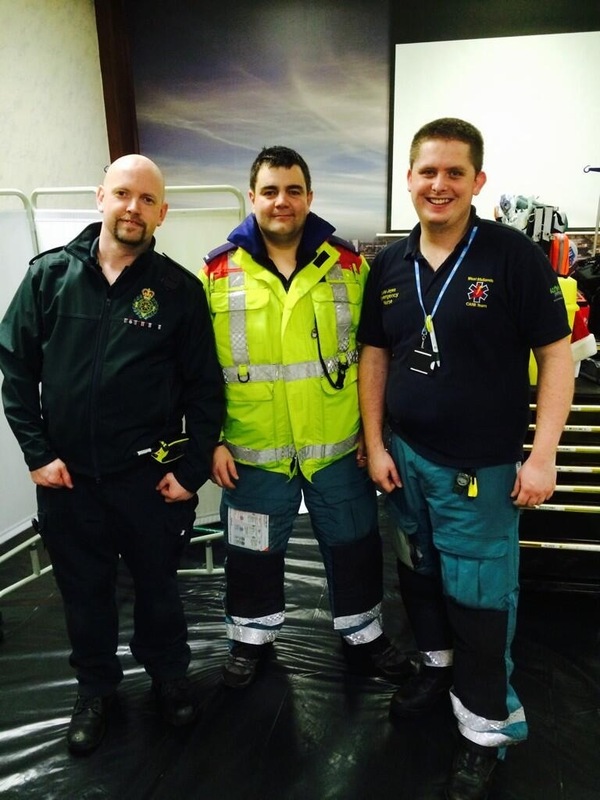 He was given pain relief before crews fully immobilised him with a pelvic binder, neck collar and spinal board. Tuesday 31st December 2013 – 11.23am – Murray MacGregor. 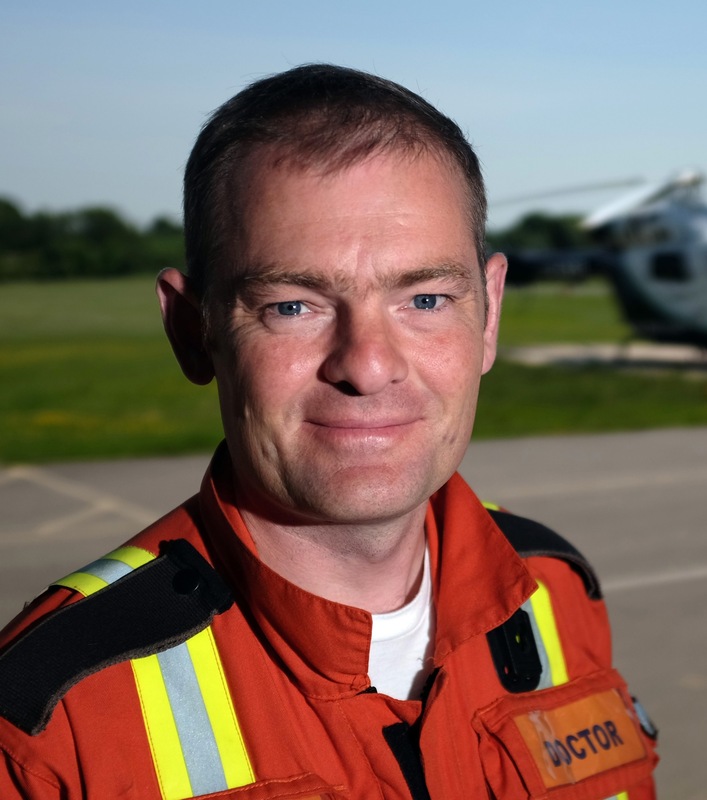 Dr Malcolm Russell, one of the Trusts Medical Incident Officer has received an MBE for services to Emergency Medicine in the New Year’s Honours. It comes only a year after he was awarded the Queen’s Diamond Jubilee Medal for voluntary work with the emergency services. 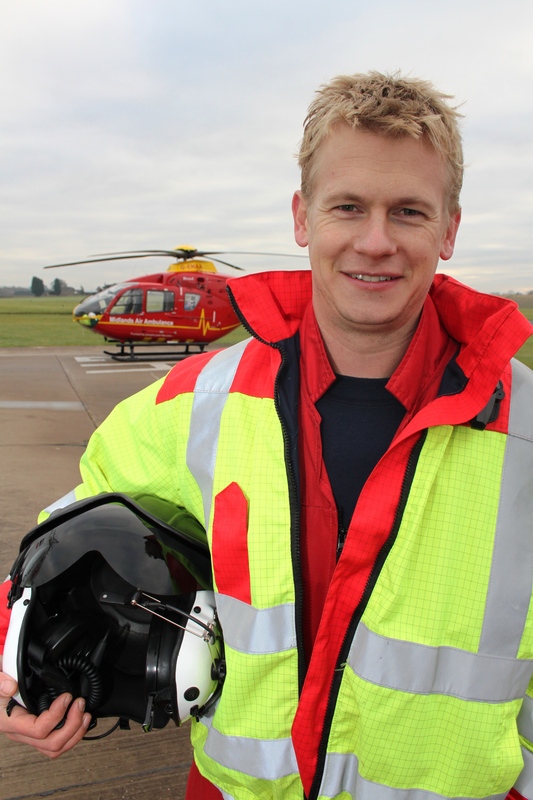 Dr. Russell often responds for the Trust as a BASICS Emergency Doctor as part of the Mercia Accident Rescue Service (MARS). In addition he has deployed to natural disasters such as the Japanese Tsunami and Christchurch earthquakes as part of emergency aid and support for those countries. Dr Russell said: “I feel very humbled to have been awarded an MBE when I work with so many other well-deserving individuals who are so dedicated to looking after our patients. “For me, this represents collective appreciation for the work we all do as a team. Tuesday 31st December 2013 – 6.40am – Murray MacGregor. Ambulance bosses are reminding pedestrians of the need to make themselves seen after an incident in the Solihull area where a woman was injured after a collision with a car. West Midlands Ambulance Service was called to Stratford Road in Shirley, just near the Sainsbury’s store at 6.55pm on Monday evening. Initially a rapid response vehicle and an ambulance were sent to the scene. A West Midlands Ambulance Service spokesman said: “On arrival they found a 62 year old woman who had suffered a nasty fracture to her upper arm. They were told that the collision had happened at low speed. “Due to the nature of the injury the ambulance staff requested the MERIT Trauma Doctor be sent to provide advanced pain relief. The woman was treated at the scene before being taken to Heartlands Hospital. “The man driving the car was uninjured but very upset. “When it is dark, we would urge pedestrians to make sure that they take extra care when crossing the road. All too often we see cases where the pedestrian was wearing dark clothes, had nothing reflective on them and wasn’t using a crossing point. “Whilst all road users should be mindful of each other, making it easier for other road users to see you makes sense. Tuesday 31st December 2013 – 12.01am – Murray MacGregor. 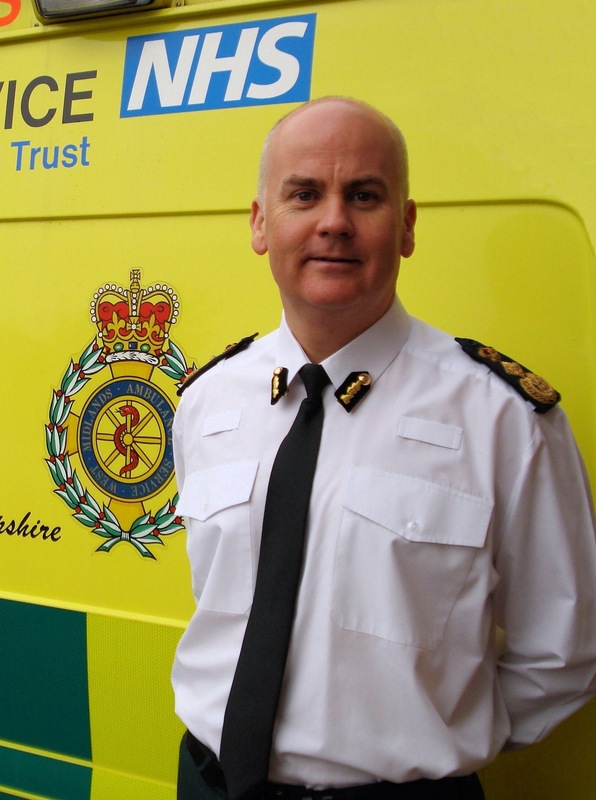 West Midlands Ambulance Service Chief Executive, Anthony Marsh, has been named in this year’s New Year’s Honours List. Mr Marsh who has been with the ambulance service for over 25 years, was announced as a recipient of the Queen’s Ambulance Service Medal (QAM). It is the second year in row that the Trust has received such recognition. 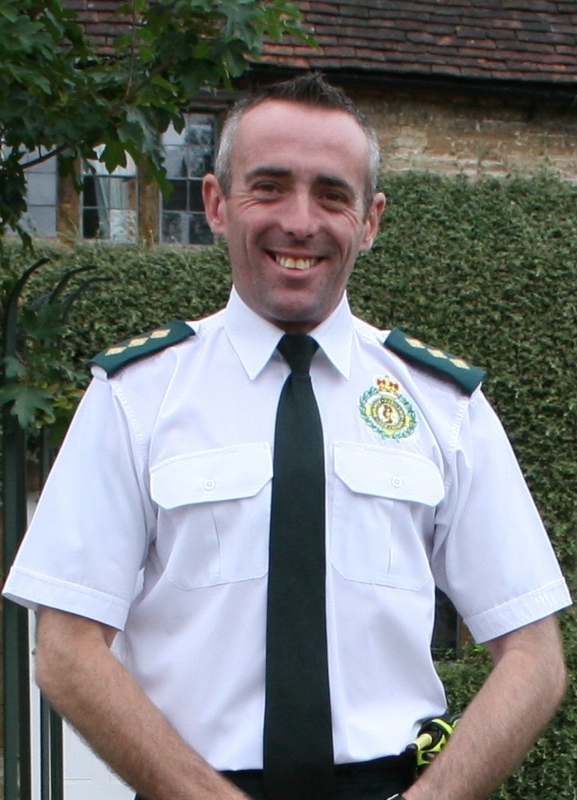 Last year, ‘Running Paramedic’ Ray Edensor from Staffordshire received the award. Mr Marsh said: “I am very honoured to have received this award. Whilst I have been extremely fortunate to have been nominated, this is down to the hard work of everyone involved in the ambulance service. Monday 30th December – 1.10pm – Murray MacGregor. The Trust is gearing up for New Year’s Eve, traditionally the busiest night of the year, when call demand can double. Sunday 29th December 2013 – 1.35pm – Chris Kowalik. 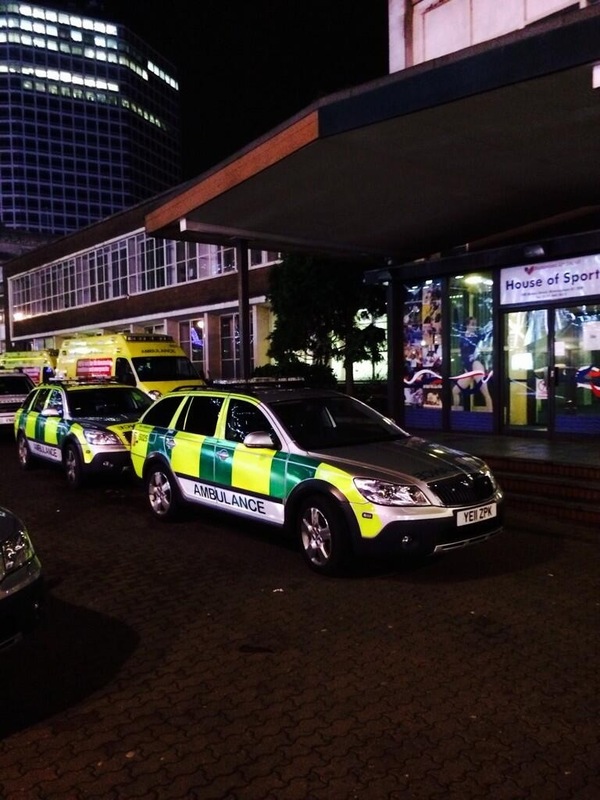 West Midlands Ambulance Service was called shortly before 12.30am today (Sunday). Police and the fire service were also called. An ambulance crew, a paramedic in a rapid response vehicle, a paramedic area support officer in a rapid response vehicle and the Trust’s Hazardous Area Response Team attended. Saturday 28th December 2013 – 11.55pm – Chris Kowalik. An elderly woman has been injured in a road traffic collision in the Black Country. West Midlands Ambulance Service was called shortly before 11am today to Holden Road, Wednesbury. Two ambulance crews, an advanced Community Paramedic in a rapid response vehicle, a paramedic area support officer in a rapid response vehicle and the Midlands Air Ambulance from Cosford attended. A West Midlands Ambulance Service spokesman said: “The woman, who is in her 90s and a backseat passenger in one of the cars involved in the collision, had a broken leg and a minor head injury. A vacuum splint was applied to her leg, she was given pain relief and was immobilised with the use of a spinal board and neck collar before being taken to Queen Elizabeth Hospital Birmingham. “The male driver of the same car had a minor injury; his female front-seat passenger was in shock. Both were taken to Sandwell Hospital. Friday 27th December 2013 – 6.30am – Suzie Fothergill. A lorry driver has died following a serious collision in Wednesbury last night. West Midlands Ambulance Service was called to the incident at the Royal British Legion on Walsall Street at approximately 8pm yesterday evening. Three ambulances, a rapid response vehicle, two paramedic ambulance officers, the Hazardous Area Response Team (HART) and the Trust’s MERIT rapid response vehicle, carrying a trauma doctor and a critical care paramedic, were dispatched to the scene. A West Midlands Ambulance Service spokeswoman said: “Crews we called to reports of a lorry that had been in a significant collision with a building. “On arrival at the scene crews found that the lorry had collided into the Royal British Legion with approximately a third of the lorry’s length being within the building. “Ambulance crews worked alongside the fire service, whilst they secured the building, to ensure that everyone that had been in the property at the time of the incident were accounted for and were uninjured. Thursday 26th December 2013 – 6.30pm – Suzie Fothergill. A driver of a car involved in a significant road traffic collision this morning has luckily escaped any serious injuries. A senior paramedic officer from West Midlands Ambulance Service came across the incident on the northbound carriageway of the M5, between junctions 2 – 1, shortly before 9.25am this morning. An ambulance was dispatched to the scene. A West Midlands Ambulance Service spokeswoman said: “An ambulance officer came across a road traffic collision involving a single vehicle on the M5 this morning. “The car, which had been carrying a single occupant at the time of the incident, was found to have been in collision with the central reservation. 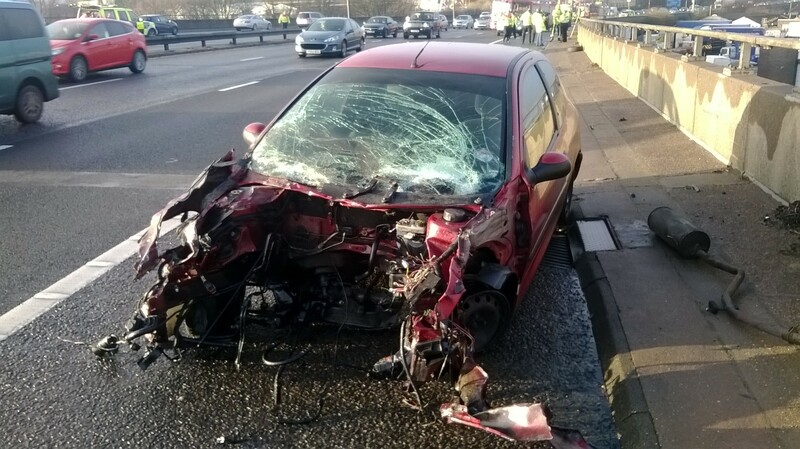 The vehicle had sustained extensive damage, with the engine of the car found on the opposite carriageway. “The driver, a 24 year old woman, was treated at the scene for minor chest and facial injuries before being conveyed to Sandwell Hospital for further assessment and treatment. Notes to editors: A picture of the incident can be downloaded. If used, West Midlands Ambulance Service should be credited. Thursday 26th December 2013 – 8.00am – John Hawker. A man has been seriously injured following a two car RTC in Nuneaton last night. The crash occurred at the junction of the A5 and The Long Shoot at around 6.10pm. Three ambulances attended the scene, along with an off duty paramedic officer who was on his way to work. A West Midlands Ambulance Service spokesman said: “Crews arrived to find two cars that had been in a significant collision. The 24 year old passenger in one car suffered pelvic and neck injuries. He also suffered a significant laceration to his head. “The man received emergency treatment at the scene and his condition was stabilised. He was transferred to University Hospital Coventry and Warwickshire for further emergency treatment. The driver of the car, a woman in her 60’s suffered back pain and was also treated at the scene. She was transferred to the same hospital for further assessment. Tuesday 24th December 2013 – 7.20pm – John Hawker. A cyclist has died following at RTC near the border of Warwickshire and Leicestershire this lunchtime. 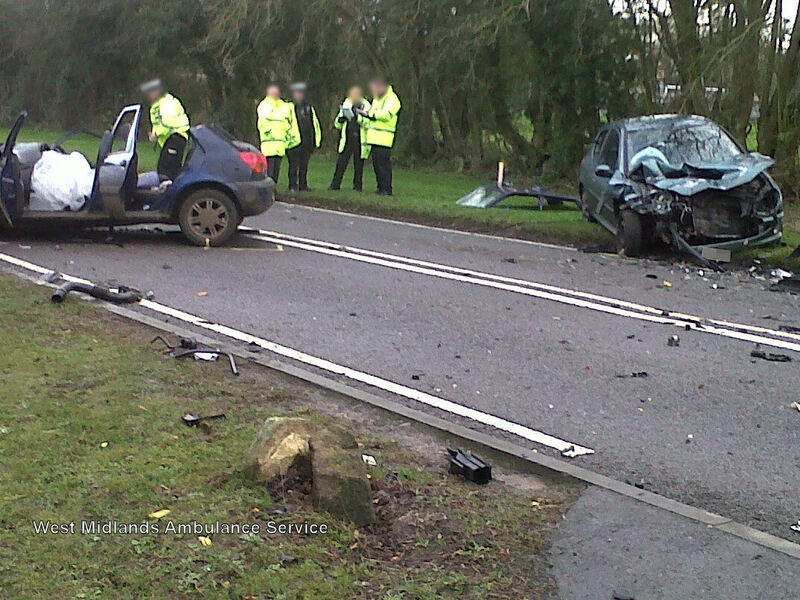 The crash occurred on the A444, near Fenny Drayton at around 11.55am. An ambulance, a rapid response vehicle, a paramedic officer, and the Warwickshire and Northamptonshire Air Ambulance attended the scene. A West Midlands Ambulance Service spokesman said: “Crews arrived to find a cyclist and a car that had been in a serious collision. “Unfortunately, nothing could be done to save the man riding the bicycle and he was confirmed dead at the scene. Tuesday 24th December 2013 – 7.00pm – John Hawker. A man has died and a second man had been seriously injured following an RTC in Hereford this morning. The crash occurred on the A4103, Withington at around 11.30am. Two ambulances, a paramedic officer, a MARS Doctor and the Midlands Air Ambulances from Strensham and Cosford attended the scene. A local off duty paramedic was also at the scene providing assistance. A West Midlands Ambulance Service spokesman said: “Crews arrived to find a small tanker lorry and a van that had been in a serious collision. “Unfortunately, it quickly became apparent nothing could be done to the man driving the tanker lorry and he was confirmed dead at the scene. “The man driving the van, believed to be in his 30’s, suffered serious leg and pelvic injuries and also a chest injury. He received emergency treatment whilst still trapped in the van and his condition was stabilised. The man was trapped for around one hour twenty minutes. We have no further details of this incident. Tuesday 24th December 2013 – 11.10am – John Hawker. Three people have been injured, one seriously following an RTC in Wolverhampton this morning. The crash occurred on Waterloo Road, near to Molineux Stadium, at around 8.05am. Three ambulances, a paramedic officer and the Midlands Air Ambulance from Cosford with a Trauma Doctor on board attended the scene. A West Midlands Ambulance Service spokesman said: “Crews arrived to find three vehicles that are believed to have been in a collision. “The passenger in one car, a woman believed to be in her 60’s, suffered serious leg and arm injuries and also suspected pelvic injuries. Due to her injuries the woman received treatment whilst still in the car and her condition was stabilised. She received pain relief and was extricated from the vehicle with the assistance of the fire service. The roof was removed from the car. “Having been immobilised using a spinal board and neck collar, the woman was airlifted to Queen Elizabeth Hospital Major Trauma Unit for further emergency treatment. The hospital had been pre alerted to the woman’s arrival and her injuries. “The male driver of the same car was uninjured in the crash. “Two people travelling in a 4×4 vehicle, a man and woman believed to be in their late 40’s, suffered multiple minor injuries and received treatment at the scene. Both were transferred to New Cross Hospital in the same ambulance for further treatment. Tuesday 24th December 2013 – 10.25am – John Hawker. 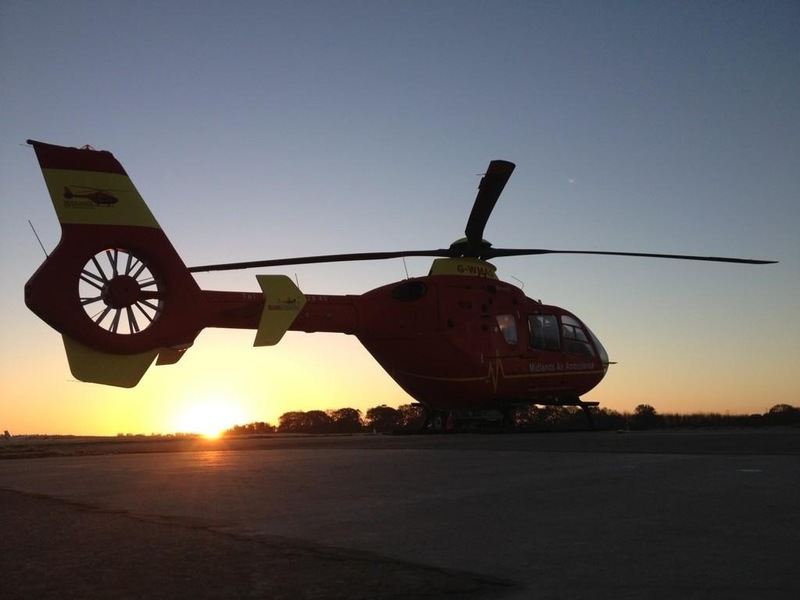 A cyclist has been injured following an RTC in Staffordshire this morning. The crash occurred on the A513, near Alrewas, Staffordshire at around 8.20am. Two ambulances, a paramedic officer and the Midlands Air Ambulance from Staffordshire and also the Derbyshire, Leicestershire and Rutland Air Ambulance attended the scene. A West Midlands Ambulance Service spokesman said, “Crews arrived to find a car and a cyclist that had been in a serious collision. The cyclist had reportedly been unconscious for a short time after the crash but was conscious when medics arrived. “The man, believed to be in his early 60’s, suffered a head injury in the crash. He received treatment at the scene, including pain relief and also immobilised using a spinal board and neck collar. “Once the man’s condition was stabilised, he was airlifted to University Hospital North Staffordshire for further emergency treatment. 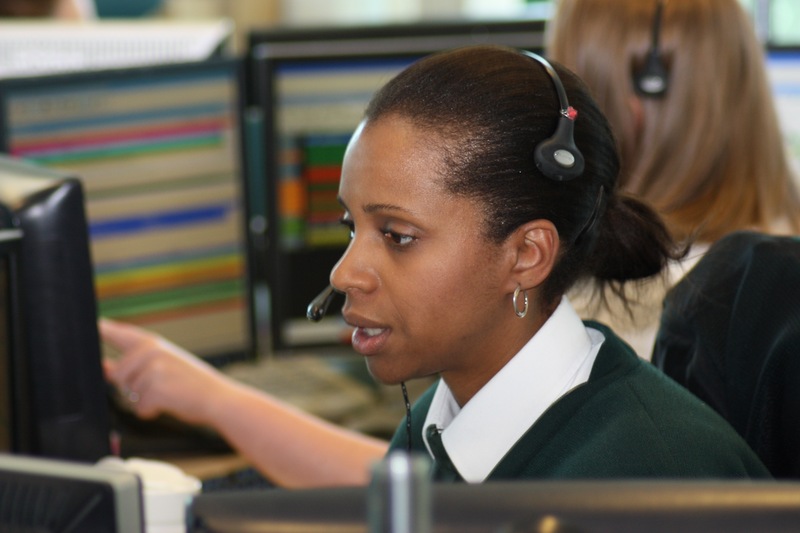 Working as an ambulance crew, we respond to 999 calls. Our job is to assess the patient, to work out the best course of action and then give appropriate care and treatment. We will make decisions about where patients should receive further treatment. This could be in A&E, at a Walk-in Centre, Urgent Care Centre, a visit by a nurse or GP or at home with some simple self-care advice. Every time we treat a patient, we record everything we’ve found out about the patient during our assessments on a confidential patient report form (PRF). If the patient is taken to hospital the PRF is handed into hospital staff. The PRF is a concise log of what the ambulance crew have established what’s wrong with the patient and the treatment given. Our main aim is to ultimately maintain life. We also try to make patients smile and comfort family members. Kelly – It’s my first Christmas off in four years and I am very excited. If I’ve been a good girl I’ll be opening lots of presents and then enjoying some quality family time, over indulging on nice food and helping my nephews play with their new toys. Dean – I worked Christmas last year and have managed to get this year off. I’m going to the inlaws for Christmas Day. It’ll be nice to watch the children open their presents, enjoy a home cooked Christmas dinner and have a few beers. The last thing anyone wants to do is give a loved one a present that they are unlikely to thank them for; the gift of Norovirus. Sometimes known as the winter vomiting, it is the most common stomach bug and affects people of all ages. Each year, it spreads through hospitals leading to visiting being stopped. However, what the public often don’t realise is that it is them who have spread it. Only last year, one hospital in the region stopped a visitor in the nick of time as they promptly threw up over the floor of reception. If you have the bug, don’t visit friends or relatives in hospitals or residential care as you could put vulnerable people at risk. The virus can survive for lengthy periods. The most effective way to tackle it is good hand-hygiene, especially after using the toilet. The symptoms last for 12 to 60 hours and most people make a full recovery within 1-2 days. It is important to drink plenty of non-alcoholic fluids to prevent dehydration but there are no long-term effects. 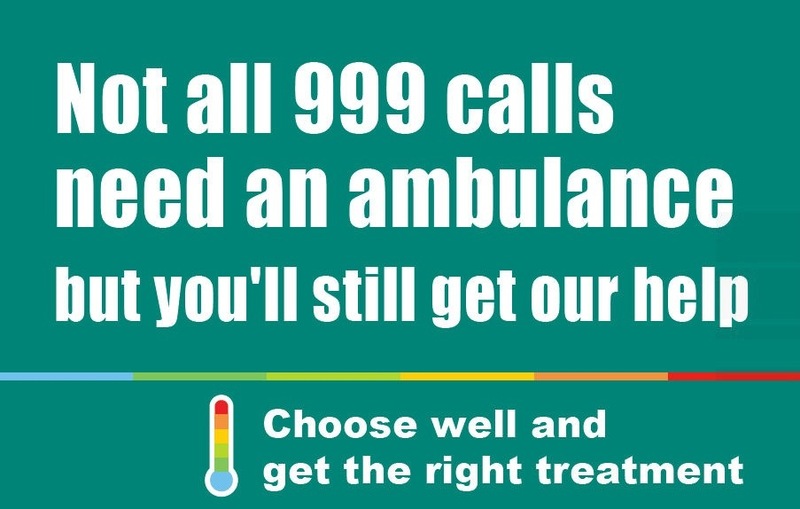 We often see people dialing 999 with the condition but sadly there is nothing that we can do to help other than provide advice; equally, don’t visit your GP or local A&E Unit unless absolutely necessary. Tuesday 24th December 2013 – 7.00am – Murray MacGregor. 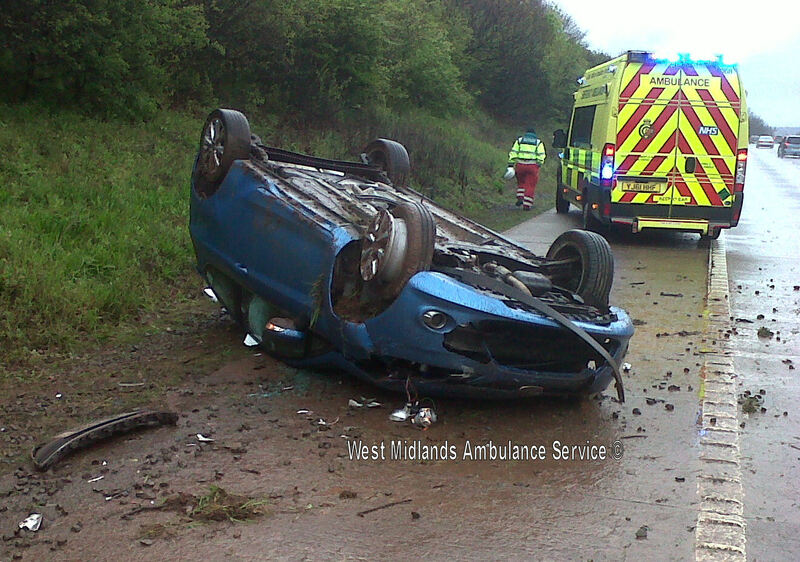 Five teenagers have been treated by ambulance staff after the car they were in rolled over in South Staffordshire. The crash happened at about 1.30am on Xmas Eve on the A460 Cannock Road, Shareshill to the north of Wolverhampton. An ambulance taking a patient to hospital came across the incident. It was backed up by two further ambulances and a paramedic officer. A West Midlands Ambulance Service spokesman said: “Crews arrived to find a single vehicle with significant damage after having flipped over. “There were five young men, all aged about 18 who had been in the car. It was extremely wet and windy at the time. “One of the five, who was a rear seat passenger had suffered a potentially very serious back injury. He was immobilised and taken to New Cross Hospital. “The driver told ambulance staff that he had come out of the vehicle as it rolled over. He had suffered a shoulder dislocation and was immobilised before being taken to the same hospital. Tuesday 24th December 2013 – 6.10am – Murray MacGregor. A woman was trapped in the wreckage of a car for over 90 minutes after it was involved in a two car crash in Worcestershire. The collision happened on the A38 at Severn Stoke to the south of Worcester at just before 10.20pm on Monday night. Two ambulances, a rapid response vehicle and a BASICS emergency doctor from the MARS scheme were sent to the scene. A West Midlands Ambulance Service spokesman said: “When crews arrived they found two cars that had suffered very significant front end damage. “The driver of the first car, a 25 year old woman, was trapped by her legs in the wreckage. Ambulance staff worked with firefighters for over 90 minutes to free her. The appalling weather conditions made the task even more difficult as the roof and dashboard were removed. “She had suffered multiple injuries. After being immobilised, she was taken on blue lights to the major trauma centre at the Queen Elizabeth Hospital Birmingham. “The driver of the other vehicle, a woman in her early 20s, had been knocked unconscious for a short period but appeared to be relatively uninjured. She was taken to Worcestershire Royal Hospital as a precaution. Tuesday 24th December 2013 – 6.09am – Murray MacGregor. A woman has died and a man has been seriously hurt after a crash to the west of Shrewsbury. The incident happened on the A458, about a mile to the west of Dinky’s Dinah in Ford. Weather conditions at the time were very difficult. A rapid response vehicle, two ambulances, a paramedic officer and the MERIT trauma doctor were sent to the scene after multiple 999 calls at just after 9.30pm on Monday evening. A West Midlands Ambulance Service spokesman said: “On arrival, crews found 3 cars at the scene. Firefighters were undertaking life support on a woman in one of the cars. Sadly despite all efforts, it was not possible to save her and she was confirmed dead at the scene. A man from the same car was assessed but was uninjured. “A man in his 30s from a second car was trapped for over half an hour. He had suffered facial, hip and leg injuries. He was transported to the major trauma centre at University Hospital North Staffordshire with the MERIT doctor travelling with the crew. Monday 23rd December 2013 – 10.10am – Chris Kowalik. A woman from Wales who was worse for wear after a night out and became separated from her friends was one of over 100 people cared for by the Temporary Minor Injuries Unit (TMIU) in Birmingham city centre over the weekend. The centre returned for its seventh year to treat worse-for-wear revellers on Friday and Saturday nights. As well as the usual catalogue of drink related injuries, one of the most concerning cases came on Friday night. A woman from Wales had been visiting the city and was due to return home. Unfortunately, she had had too much to drink and had become separated from her friends. Worse, she didn’t have her mobile phone and her personal belongings were in a locker at New Street railway station. She was cared for at the unit until the effects of alcohol had worn off and was then taken to New Street station on Saturday morning to continue her journey home. This was just one of 46 cases dealt with while the unit was operating over Friday night and the early hours of Saturday morning. In addition to looking after office party revellers who had had too much to drink, medics also glued and stitched wounds sustained by falls and assaults. 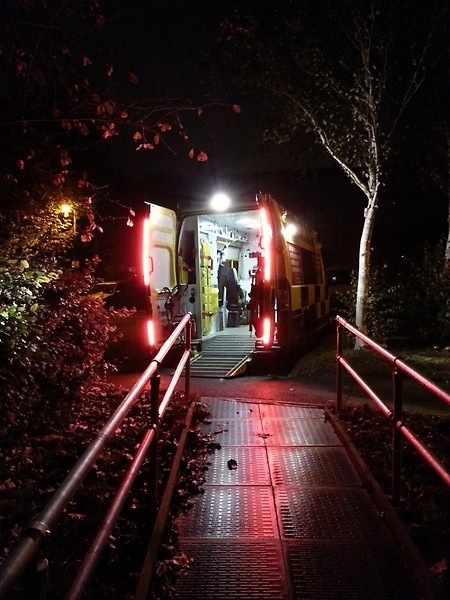 A West Midlands Ambulance Service spokesman said: “Once again, the value of the unit has been proven looking after over 100 people over the two nights. Those are 100 people that could have ended up in a city centre A&E department. “What it also demonstrates is the risk that some people are prepared to take in the name of having a good time. “We certainly want everyone to enjoy themselves, but it is important that you look after yourself and, if you are out with friends, look after each other. The TMIU is a successful partnership venture with WMAS paramedics, technicians, Central Accident Resuscitation Emergency (CARE) Team nurses and doctors, Fastaid Community First Responders and volunteers from the British Red Cross and St John Ambulance. It is equipped to provide patients who arrive at the unit by ambulance or by foot with fast and efficient treatment to avoid a long wait in accident and emergency. As well as medical staff, the unit is supported each night it operates by special constables from West Midlands Police and Birmingham’s City Pastors. 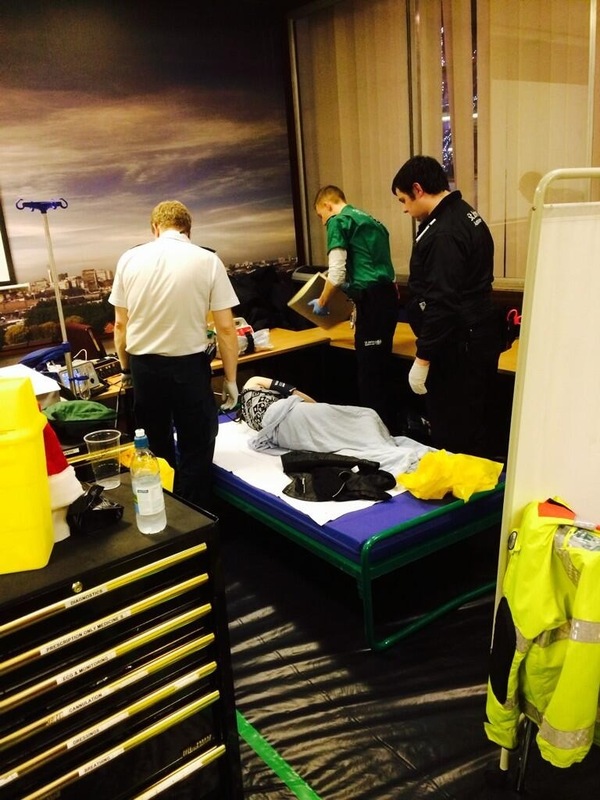 * WMAS – 2 ambulance crews, 3 responder paramedics, 4 paramedic officers. * British Red Cross – 2 ambulance crews plus an additional 3-4 volunteer Enhanced Skills First Aiders. * CARE Team – a doctor, two nurses. 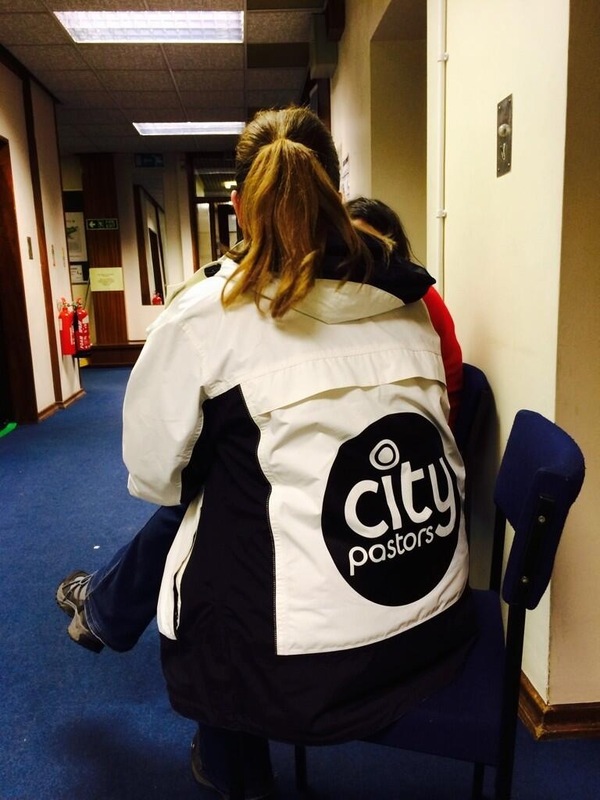 * City Pastors – 2 pastors at the TMIU with an additional 4 working in and around Broad Street and South Side. * West Midlands Police – two special constables. Hospital A&E departments across Birmingham! I am based in Birmingham’s A&E departments. 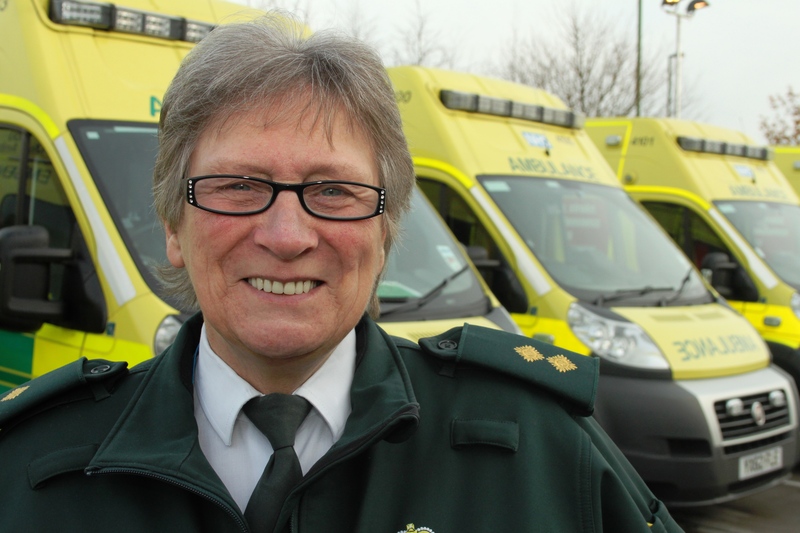 I am responsible for ensuring our ambulance crews are able to hand over patients to hospital nursing staff promptly. My role includes working with the nursing staff, hospital managers, ambulance crews and the Trust’s emergency operations centre. At times of high demand when there is an increase of 999 calls and an influx of ambulances to hospitals, this is where my role is vital. Patient care is paramount and team work is the key to ensuring patients are handed over quickly to allow the ambulance crew to respond to the next 999 call. If, for any reason, they’re delayed at hospital, I am on hand to help resolve any problems or issues. I am working Christmas Day this year. I’ll be having my Christmas Day celebrations and dinner with my two children, their partners and my husband on the 28th December. Christmas is a time for merry-making and family get-togethers, but it can have its pressures too. Let’s face it; the festive season can be one of the most stressful times of the year. The combination of (too much) drink, relatives staying, a lack of sleep, presents to buy and find time to wrap them; stock up on food…and cook it, the kids are overexcited, there’s the tree to decorate; frankly, it can all be just a bit too much and that the festive feeling can fizzle out pretty quickly. Statistics show that January is the busiest month for divorce lawyers! To make sure Christmas doesn’t become a day to remember for all the wrong reasons, try some of these tips: try and resolve any family rows during the year; plan the day and share out the jobs that need to be done. Don’t slave away for hours on your own and feel like people have taken advantage of you; listen to the ideas and suggestions of others so that you can try please everyone; don’t drink too much; plan a lovely long walk so that the kids boundless energy is reduced and you get out of the house for a bit; try to find some time alone, even if it’s only to have a relaxing bath; and learn to say no to the demands of others…in a nice way. Due a technical fault – this window wouldn’t open yesterday – but today you get to open two windows! I provide pre hospital care to patients at the scene of serious incidents and offer support to ambulance crews across the Region. On a day shift, MERIT responds to 999 calls with a paramedic on the Midlands Air Ambulance from Cosford and at night we revert to four wheels and respond from a base Oldbury. MERIT is predominantly geared towards major trauma cases and complex injuries where the focus shifts to getting the right medical care to the patient rather than getting the patient to the right care. As a MERIT doctor I’m able to give patients more advanced treatment at the roadside including anaesthesia, surgery and advanced painkillers, further enhancing the treatment given by ambulance crews. I’m responded to patients with severe or complex injuries, prolonged incidents or those with multiple casualties such as high speed road traffic collisions, industrial accidents, stabbings and shootings. This Christmas I’ll be spending it at home with my family…..however I may end up at a 999 call if there’s an incident nearby as I’m a MARS (Mercia Accident Rescue Service) BASICS doctor and respond in my spare time for the ambulance service. You might be quicker visiting your pharmacy. Saturday 21st December 2013 – 5pm – Steve Parry. Two people have been taken to hospital following a road traffic collision near Hinstock in north Shropshire this afternoon. West Midlands Ambulance Service was called to the scene at Shakeford, Hinstock just after12.45pm. Two ambulances, a paramedic in a rapid response vehicle, a paramedic officer, together with the Welsh Air Ambulance were sent to the scene. “A man in his thirties was trapped in his car after it came to a halt against the wall of a public house. He was released and treated for arm and hand injuries. The patient was taken by land ambulance to the University Hospital of North Staffordshire. When someone calls 999 for an ambulance in the West Midlands, I’m one of the people you’ll speak to. The first three questions we ask on a 999 call are really important and help us to arrange the most appropriate help for you; ‘is the patient breathing, what’s the address of the emergency, what’s the telephone number you’re calling from?’. If we know the patient isn’t breathing, they take priority and I ensure my dispatch colleagues on the other side of the room send an ambulance immediately. Before we ask what’s happened, it’s vital that we know where the patient is and also the telephone number you’re calling from. The reason we ask for your telephone number is in case the call gets cut off and we need to call you back. It also can help us to locate roughly where you are if you’re in an unfamiliar area, but we will still need to get an exact location so that we don’t delay the help reaching the patient. Whilst we’re on a 999 call and getting more information about the patient using the triage questions, we’re already busy in the background arranging the best help for you. Over the phone, I can give you some advice on how to give basic life support, like how to control bleeding, how to help deliver a baby, or how to carry out CPR instructions. Sometimes, when all life threatening symptoms have been ruled out and a patient doesn’t need an ambulance response, I can help you to arrange alternative support for the patient. It is sometimes better for the patient to ring their own GP if they don’t need hospital treatment. We always have the patient’s best interests in mind, and we will always advise you to call us back on 999 if the patient gets worse in any way. I worked Christmas Eve, Christmas Day and Boxing Day last year but am only working on Christmas Eve this year thankfully. I’m really looking forward to spending a Christmas Day with my family this year and even more excited about playing with all of my nieces and nephews new toys! Believe it or not, we do get called to people who are suffering from a hangover. If you are going out to party, then there are ways of making it more bearable the next day. Alcohol is a diuretic which means it removes fluids from the body, so drinking excessively can lead to dehydration, which is the main cause of your hangover after a heavy session. Have something to eat before you go out, especially rice or pasta. Drink water or non-fizzy soft drinks in between each alcoholic one; fizzy drinks actually make it worse as they speed up the absorption of alcohol into your system. 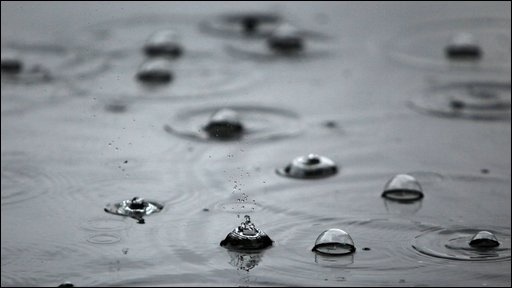 Drink a pint or so of water before you go to sleep and keep some beside your bed in case you wake up during the night. If you wake feeling terrible, you probably didn’t follow this advice. There are no cures for a hangover, but paracetamol based pain killers can help and you should replace lost fluids by drinking water, soda water and isotonic drinks. Sugary foods can also help. ‘Hair of the dog’ (drinking more alcohol) does not help! You will simply delay the appearance of symptoms until the alcohol wears off again. If you’ve had a heavy drinking session, please wait 48 hours before drinking any more alcohol. Friday 20th December 2013 – 7.30pm – Steve Parry. A man has been airlifted to hospital following a road traffic collision on the A44 at Monkland near Hereford this afternoon. West Midlands Ambulance Service was called to the incident just after 3.30pm. An ambulance together a paramedic officer, the Midlands Air Ambulance from Strensham and a trauma doctor from the Mercian Accident Rescue Service (MARS) were sent to the scene. A West Midlands Ambulance Service spokesman said: “Ambulance crews responded to a collision between a car and car towing a caravan. “Crews treated a man in his seventies. The patient was treated for a serious head laceration. Friday 20th December 2013 – 3.40pm – Steve Parry. Two people have been taken to hospital following a road traffic collision near Moreton in Marsh this afternoon. West Midlands Ambulance Service was called to Kitebrook, Little Compton near Moreton in Marsh just after 1.30pm. Two ambulances, a paramedic in a rapid response vehicle and a paramedic officer were sent to the scene. They were joined by the Warwickshire and Northants Air Ambulance and a response from Great Western Ambulance Service. 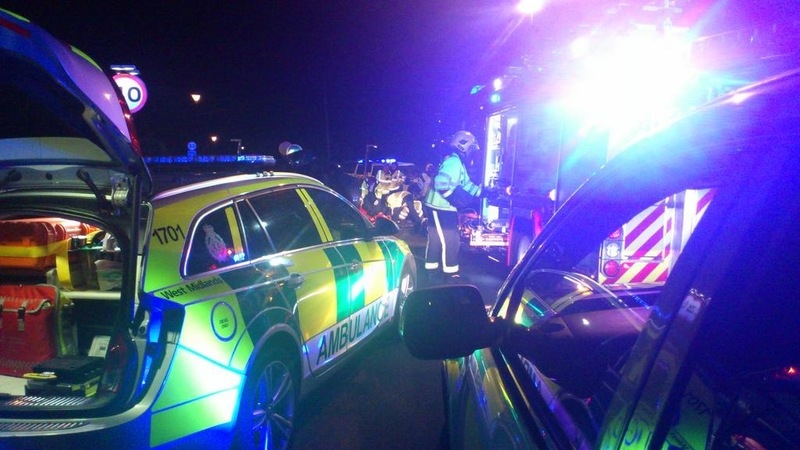 A West Midlands Ambulance Service spokesman said: “Ambulance crews responded to a road traffic collision and treated patients from each of the three vehicles involved. “A female in her 70s was trapped in her vehicle. She was rapidly extricated and treated for lower leg injuries before being airlifted to the University Hospital of Coventry and Warwickshire. “In the second car, Crews treated a female in her sixties for chest injuries. She was immobilised with the use of a neck collar and spinal board before being conveyed to Banbury Hospital by land ambulance. “A man from the third vehicle was also assessed at the scene by ambulance crews before being discharged. Friday 20th December 2013 – 3.30pm – Steve Parry. A woman has been injured after the car she was driving collided with a cottage in Codsall this morning. West Midlands Ambulance Service was called to Codsall Wood Road shortly after 11.30am. An ambulance, a paramedic in a rapid response vehicle and a Community First Responder attended the scene. A West Midlands Ambulance Service spokesman said: “Crews treated the driver of a car following a collision which significantly damaged a cottage. “The woman in her thirties was treated for chest, neck and shoulder injuries. “She was immobilised with the use of a neck collar and spinal board before being conveyed to New Cross Hospital for further assessment and treatment. Friday 20th December 2013 – 2.00pm – Claire Brown. Ambulance staff are gearing up for one of the busiest weekends of the year and are appealing to festive drinkers to go steady……or go home. While thousands of people across the West Midlands will be celebrating Christmas with friends and family, ambulance services across the country will be working harder than ever to deal with the expected increase in alcohol related 999 calls associated with the festive period. Daren Fradgley, Assistant Chief Ambulance Officer, said: “We hope that everyone out celebrating has a great time, but, we’re asking people to drink responsibly so that you don’t end your night being treated by us. “Sadly, as is always the case at this time of year, we’re expecting to see an increase in 999 calls to people who have drunk far too much alcohol. Typically our crews respond to cases of people who have slipped over and hurt themselves or been injured after alcohol fuelled misunderstandings turn to violence. We have also had cases where people have gone to sleep outside on their way home and suffered from exposure and even hypothermia when it’s cold. Have a plan on how you are getting home. Book private hire cars in advance or, alternatively, only use Hackney Carriages. Look after your friends and keep in contact with them if you split up to ensure you all stay safe. My role is about community engagement and improving patient outcomes. I look after a team of 15 staff and, together, we are responsible for recruiting and training of volunteer Community First Responders, working with the community to support the placement of defibrillators and engagement with our local communities. There are around 1,000 CFRs across the West Midlands region who give up their time to respond to 999 calls in their local area. I am responsible for ensuring that we provide high quality of care and comply with governance for all of community response activity and, most of all, that the volunteers enjoy what they do! Engagement with local communities is vital; we train people in emergency life support skills such as how to recognise a heart attack, deal with an unconscious casualty, choking or serious bleeding through a national recognised initiative. We know that the quicker someone in cardiac arrest receives CPR, the better their chances of survival and working with schools, other emergency services, the British Heart Foundation and other organisations means we can teach basic life support to thousands of people. Automated External Defibrillators are another key to saving lives. We’ve supported the installation of hundreds of devices in various locations across the Region including butchers, leisure centres, schools, train stations, shopping centres and companies. I will be doing an early shift on Christmas Day, starting at 7am and hopefully finishing at 3pm, providing management support to staff as well as responding to 999 calls in Birmingham and the Black Country. I’ll also be hoping to find a cheeky mince pie during my shift before returning home to enjoy Christmas dinner with my fiancé, family and my dog. Shereen is a Patient Transport Service Apprentice and is studying for an intermediate level apprenticeship in Health (Healthcare Support Services), which involves her undertaking hands on work experience alongside our PTS staff. Apprentices are provided with the opportunity to develop a wide range of skills over the 12 month programme and on successful completion of the course, all of our apprentices can apply for substantive posts. 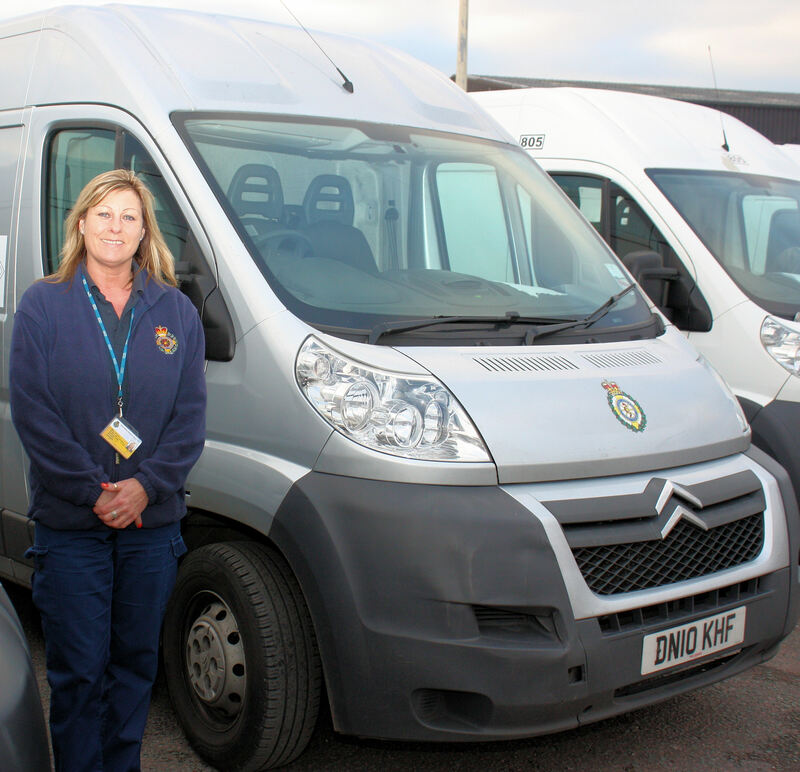 Our non-emergency Patient Transport Service plays a key role in ensuring thousands of patients from around the region get to their outpatient appointments each day. Every year, our staff complete an incredible 800,000 PTS journeys. 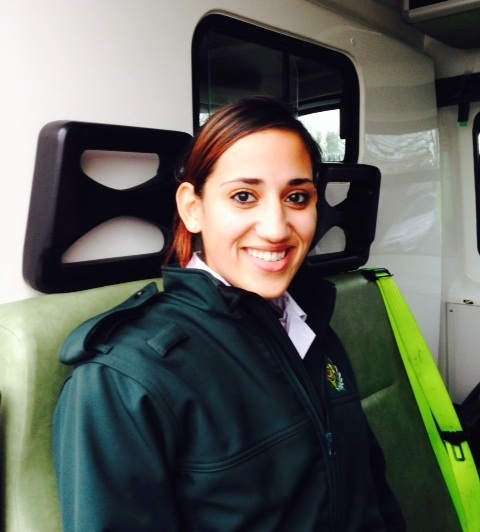 Shereen, who has always wanted to work for the ambulance service, really enjoys working with the staff and patients in Coventry and Warwickshire. She thinks the apprenticeship scheme provides a great opportunity; enabling her to carry out a job that she loves, whilst gaining the qualifications that she needs to progress within service. Shereen will spending time with her two lovely children on Christmas day. The last thing anyone wants is to celebrate Christmas with a case of food poisoning. Sadly, our crews end up dealing with many cases each festive period. Here is some simple advice: Store food that needs to be chilled in the fridge until you need it. Make sure the fridge temperature is below 5°C. Always wash your hands before and after handling food, especially when raw meat and poultry is involved. Defrost the turkey can take up to 48 hours if it is a large bird. Work out the times before you start. Eighty per cent of people say they wash their turkeys before cooking them, but this significantly increases the risk of food poisoning by splashing germs around the kitchen. Meanwhile, 17% of people aren’t sure how to tell when their turkey is cooked. Make sure your turkey is steaming hot all the way through before serving. When you cut into the thickest part of the turkey, none of the meat should be pink. If juices flow out when you pierce the turkey or when you press the thigh, they should be clear. Thursday 19th December 2013 – 2.20pm – Claire Brown. A cyclist has been seriously injured in a road traffic collision in a Warwickshire village this morning. West Midlands Ambulance Service was called to reports of a collision involving a cyclist and a lorry outside the Wharf Inn Pub on Wharf Road, Fenny Compton, Southam, at around 10.30am today (Thursday). An ambulance, a paramedic area support officer and the Warwickshire and Northamptonshire Air Ambulance with a doctor on board attended the scene. A West Midlands Ambulance Service spokeswoman said: “Crews were told a lorry had been in collision with a cyclist. The cyclist, a man believed to be in his 70s, had been thrown from his bike and was lying in the road but was conscious and breathing. “Upon assessment, ambulance crews found he had suffered a nasty fracture to his right foot and suspected fractures to his left leg. The man was administered pain relief before being immobilised with leg splints, a neck collar and a spinal board. He was airlifted to University Hospital Coventry and Warwickshire for further assessment and treatment. Thursday 19th December 2013 – 9.50am – Chris Kowalik. You don’t need an ambulance if you stubbed your toe. If you have toothache, what you need is a dentist. But these are some of the types of calls West Midlands Ambulance Service gets; cases that can be better dealt with elsewhere, leaving us to save those whose lives are genuinely at risk. 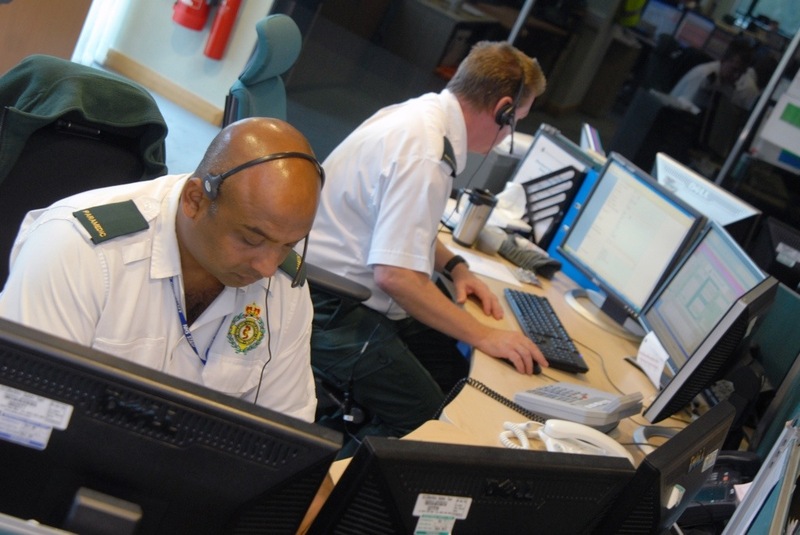 West Midlands Ambulance Service gets up to 3,000 ‘999’ calls every day, approx. ten percent of which are genuinely life-threatening. We are there to deal quickly and efficiently with cardiac arrests, strokes, serious blood loss, chest pain or states of unconsciousness. What else can you do and where else can you go? 1: Self care – Stock-up with over-the-counter medicine including sticking plasters. 2: See your local chemist – they can advise on and provide treatments and medications. 3: Call 111 – it’s a free call. 4: Visit a ‘walk-in’ centre, urgent care centre or minor injury unit. You don’t need an appointment. 5: See your GP: Every GP has an out-of-hours service. Call the surgery number. If our control rooms and ambulance crews are dealing with relatively minor conditions, they may not be able to get to the patients with genuine life-threatening illness or injury as quickly as we would want, which ultimately could put lives at risk. Thursday 19th December 2013 – 8.40am – Claire Brown. 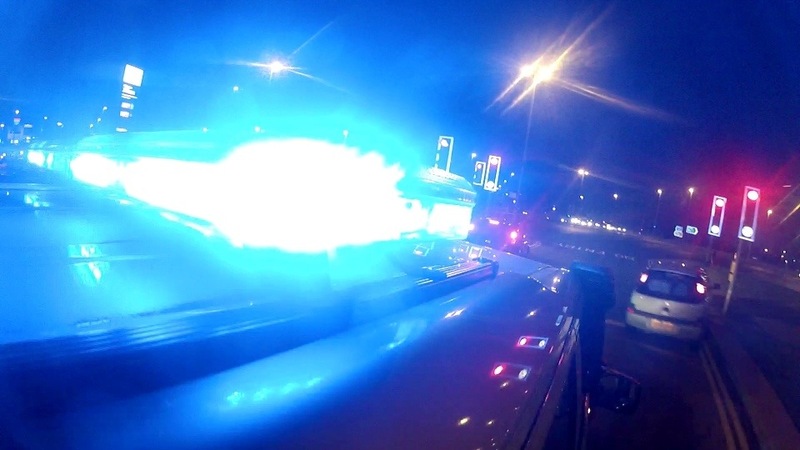 A man has died in an incident on a Coventry road last night. 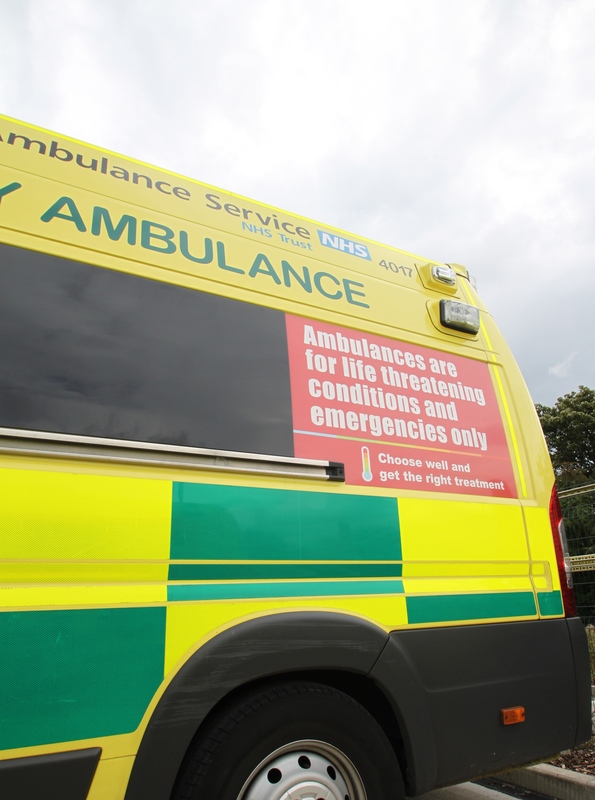 West Midlands Ambulance Service received a 999 call to reports of a man lying injured at the side of the A46 between the A428 and the M69 / M6 junction shortly before midnight (Wednesday). An ambulance, a responder paramedic and a paramedic area support officer attended the scene. A West Midlands Ambulance Service spokeswoman said: “Ambulance crews arrived on scene to find a man at the side of the road with multiple injuries. Sadly, it quickly became apparent that nothing could be done to save him and he was confirmed dead at the scene. Thursday 19th December 2013 – 8.10am – Claire Brown. A man has died after the car he was in collided with a tree in Stoke-on-Trent yesterday evening. The incident happened outside Blakeley Farm on the Leek Road in Kingsley Moor, at 8.30pm last night (Wednesday). A paramedic area support officer and a responder paramedic attended the scene. A West Midlands Ambulance Service spokeswoman said: “Upon arrival, the emergency services found a car which had left the road and had been in collision with a tree. “Sadly, it quickly became apparent to the paramedics that nothing could be done to save the single occupant of the car, a man, and he was confirmed dead at the scene. Wednesday 18th December 2013 – 9.30pm – Claire Brown. Despite advanced life support by ambulance staff, a man has sadly died in a road traffic collision in Smethwick this evening. West Midlands Ambulance Service was called to reports of a road traffic collision involving a car and a pedestrian on Thimblemill Road shortly after 6.00pm today (Wednesday). Two ambulances, a responder paramedic, an area support officer and a MERIT trauma doctor attended the scene. A West Midlands Ambulance Service spokeswoman said: “Crews arrived to find a male pedestrian who had been seriously injured. “The man’s condition quickly deteriorated and he went into cardiac arrest. Ambulance crews and the medic immediately commenced resuscitation at the scene but, sadly, nothing could be done to save the man and he was confirmed dead a short time later. Wednesday 18th December 2013 – 9.15pm – Claire Brown. A tree has landed on-top of a car during this evening’s strong winds leaving one man seriously injured in Warwickshire. 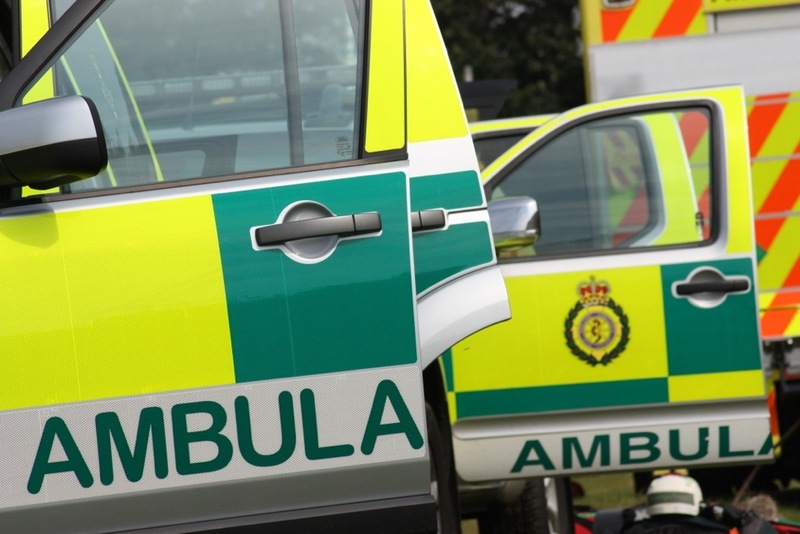 West Midlands Ambulance Service received a 999 call to an incident on the A45 between Stretton-on-Dunsmore and Rugby at around 6.00pm (Wednesday). Two ambulances, a paramedic area support officer and a critical care paramedic and doctor from the Warwickshire and Northamptonshire Air Ambulance base, who responded to the incident in a car, were sent to the scene. A West Midlands Ambulance Service spokeswoman said: “The large tree had fallen onto a car, travelling on the A45, and had smashed the windscreen. The three occupants of the car were assessed by ambulance crews. The driver and the rear seat passenger, both men in their 40s and 50s, were said to be ‘walking wounded’ and had suffered minor injuries. “The front seat passenger, a 19 year old man, sustained face and head injuries as well as suspected chest injuries. Due to the man’s condition, the doctor took the decision to anaesthetise him on scene to help stabilise him. “The man was immobilised with a neck collar and spinal board before being taken by land ambulance to University Hospital Coventry and Warwickshire. Wednesday 18th December 2013 – 6.00pm – Suzie Fothergill. 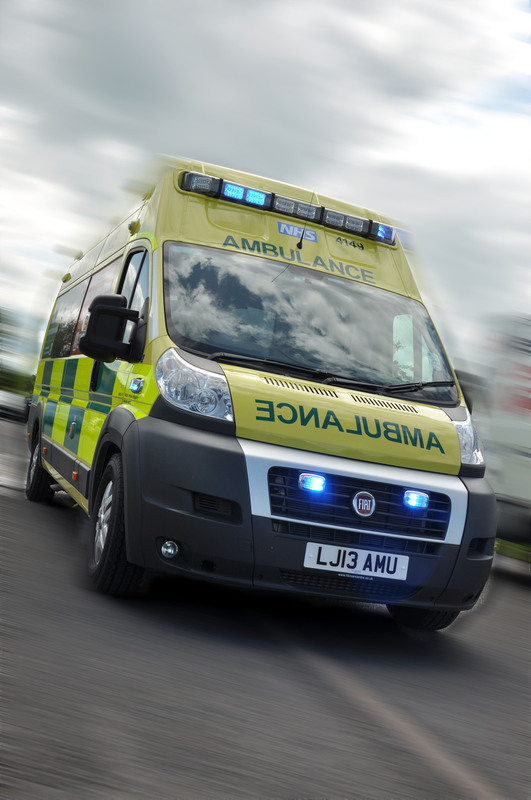 A motorcyclist has been injured in a road traffic collision in the Black Country this afternoon. West Midlands Ambulance Service was called to reports of a car and a moped that had been in collision on the Birmingham New Road in Coseley, Bilston at approximately 4.15pm today. An ambulance, a rapid response vehicle, a paramedic area support officer and a rapid response vehicle, carrying a trauma doctor and a critical care paramedic, from the Midlands Air Ambulance base in Cosford were dispatched to the scene. A West Midlands Ambulance Service spokeswoman said: “Crews treated the motorcyclist for suspected pelvic and leg injuries at the scene. “The man, believed to be in his mid-20’s, was given pain relief and fully immobilised before being conveyed to the major trauma centre at Queen Elizabeth Hospital Birmingham for further assessment and treatment. With the number of people suffering from colds, coughs and flu rising rapidly at the moment, it is more important than ever that the public help themselves and each other by practicing good hand hygiene. Believe it or not, one of the most effective ways of protecting everyone is by remember the simple phrase: Catch it. Bin it. Kill it. A West Midlands Ambulance Service spokesman said: “Almost everyone will get a cough or cold at some point this winter. When it’s your turn or someone in your family or a friend, you can play a vital role in reducing the chance of the germs spreading. “Studies have shown that respiratory infections are reduced in groups of people who practice good hand and respiratory hygiene measures. “Cold and flu germs can live on your hands and in tissues for hours for hours, meaning they can be easily transmitted. Just a few simple steps can help prevent the viruses from spreading. “The advice is also likely to have a positive effect on other diseases such as Norovirus which leads to diarrhoea and vomiting. “Sadly there is nothing that the ambulance service, A&E or your GP can prescribe which will help you through your cough or cold; you just have to tough it out. Use over the counter medicines, keep yourself hydrated and warm as well as getting plenty of rest. “Please also remember that it is not too late to get a flu jab which will protect you from having a really miserable two weeks. Catching the flu is nothing like having a cold, even a bad one. I work at Trust HQ in the IT department as Senior IT Technical Support. 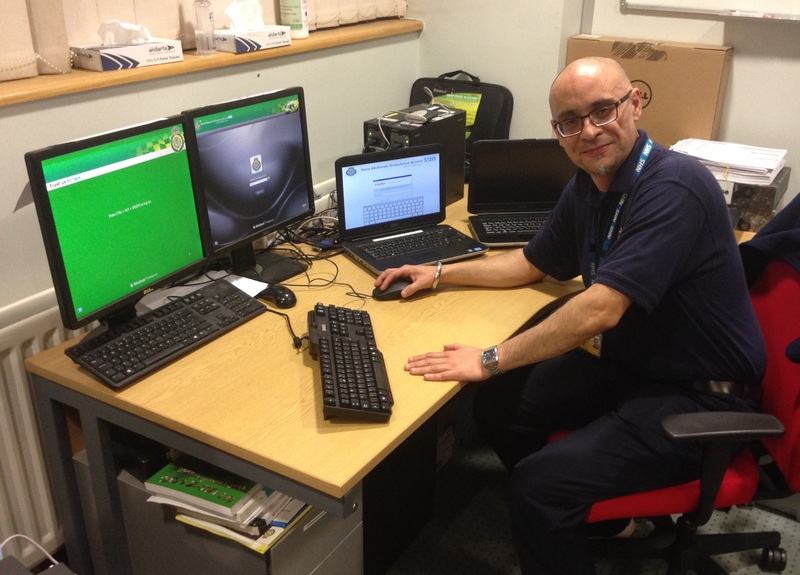 Part of my role is to help ensure that all computer systems and IT hardware work appropriately for the 999 system, and also IT at headquarters and on station for staff. If there is a fault flagged up with any system we have a member of staff on site 24/7 manning the IT helpdesk to try and fix the problems as soon as possible. Obviously the 999 call system and related IT programmes are our priority. I enjoy my job and get satisfaction from knowing that as a ‘behind the scenes’ department, we make a telling contribution to the 999 system running smoothly when patients make that emergency call. I will be spending Christmas Day relaxing with my wife, but I will be working New Year’s Eve and New Year’s Day manning the Trust’s IT Helpdesk ensuring that everything IT wise is working correctly (fingers crossed!). As an ambulance service it is the busiest time of the year, so I will be on hand to sort out any IT issues as quickly as possible. Think ahead – In the run up to Christmas, we all make sure we have everything we need from the supermarket so that we can enjoy the big day with family and friends…and probably eat and drink a bit too much. However, making sure that you prepare medically is also important. Each year, the 999 service gets several calls from worried members of the public who have woken up on Christmas Day and found that they have run out of their medication. Sadly, there is nothing that we can do to assist you. Therefore, please make sure that you have enough medication to last when your GP surgery is closed. It’s important that you book any routine appointments with your practice in plenty of time and ensure that you have enough medication to last you over these times. Don’t use A&E as a back-up pharmacy, plan ahead. Tuesday 17th December 2013 – 1.15pm – Chris Kowalik. Much Wenlock Community First Responders Robin Bennett and Colin Marlow have launched a fundraising campaign to buy additional emergency medical equipment for the town. 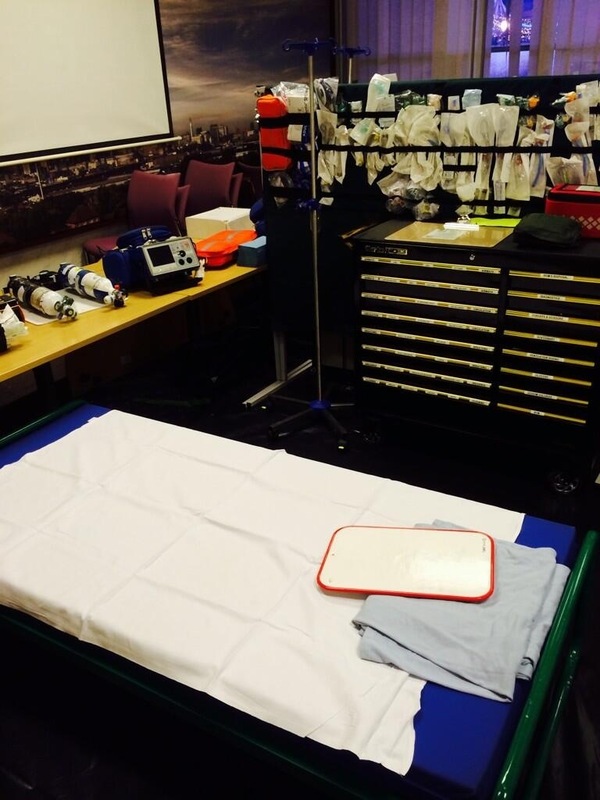 Community First Responders (CFRs) are volunteers trained by West Midlands Ambulance Service to give assistance in “999” medical emergencies until an ambulance arrives. One of their key roles is in cardiac arrests where the early use of a defibrillator can be lifesaving. 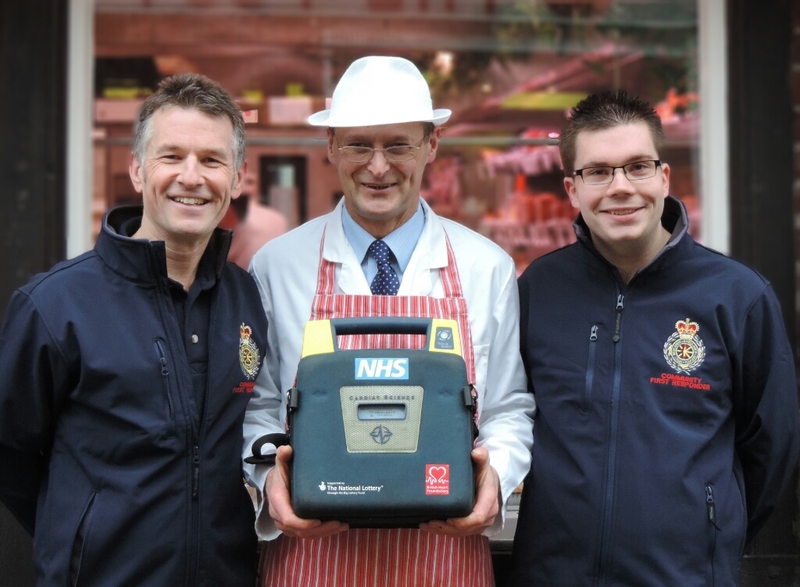 Robin & Colin are aiming to raise the £3,000 needed to buy a public-access defibrillator for the town as well as an additional unit for their own use when on call. 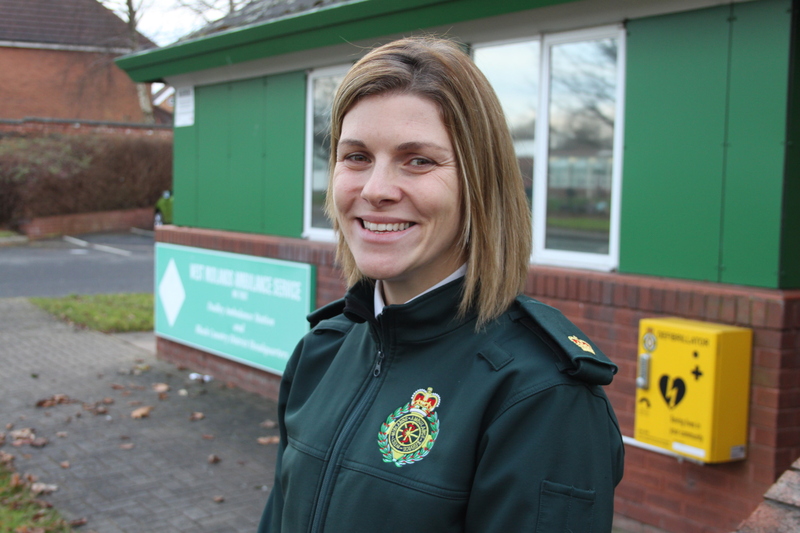 I work as a Paramedic Area Support Officer in the Warwickshire area, managing the shift that I am on and ensuring it runs smoothly, solving any issues that occur as quickly as possible. I also attend serious incidents to manage the scene and multiple resources to ensure that all patients get the best treatment as soon as possible. Ensuring the welfare of staff is also a priority, especially with some of the disturbing scenes they attend on a daily basis as part of the job. Providing support and advice to our front line staff is vital. I will be spending the first part of Christmas day with my partner before I head to Warwick Station to work the Christmas day night shift between 7pm and 7am. I will then be back in to do the same shift on Boxing Day from 7pm!! When you speak to almost any of our crews, they will almost all have a story where a completely innocent party has died or been seriously injured as a result of drink driving. Being drunk in charge of a car is simply not acceptable. If you have had even one drink, we would urge you not to get behind the wheel of a car as even that one drink will slow your reaction times down. Last year, as a result of drink driving on Britain’s roads, 290 people were killed; 1,210 people suffered serious injuries and 8,500 people were slightly injured (Department of Transport). Among those killed in drink-drive accidents, 68% were drivers, motorcyclists and cyclists over the legal alcohol limit. Not only will our colleagues in the police be vigilant of an evening an increasing number of people are being caught the morning after the night before. It’s all too easy to think that after a night’s sleep you’ll be ok. However, it will depend how much sleep and how many drinks you had as to whether you will be under the limit. Please plan ahead and don’t drive if you are not within the legal alcohol limits as the advert says, ‘drink driving wrecks lives’. Our crews know that only too well. Safe journey or last journey? Tuesday 17th December 2013 – 9.00am – John Hawker. The excitement is growing with children and adults all over the West Midlands in the run up to Christmas. 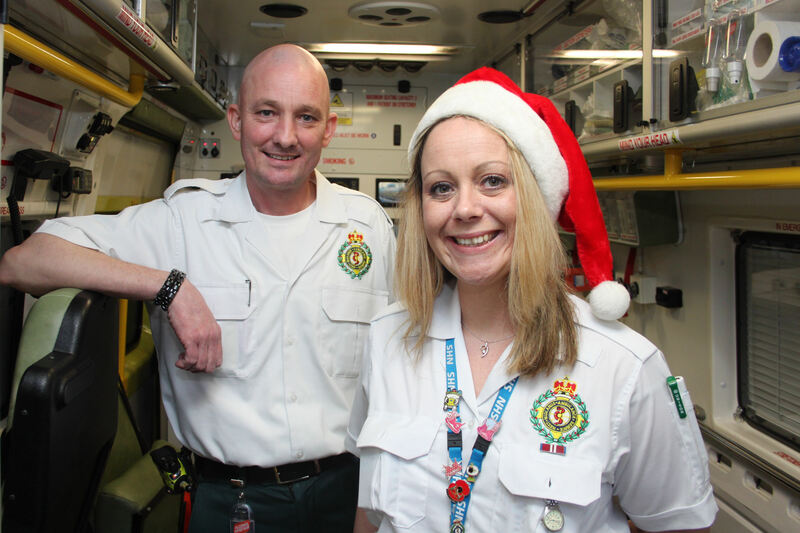 With thousands of people doing last minute shopping, other preparations, and visiting family and friends, ambulance staff are appealing to the public to ensure that this year is not one to forget for tragic reasons. Over the festive season it is a particularly poignant time to remind everyone to drive safely. By taking simple steps and using common sense, people can ensure that everyone has a happy Christmas and New Year. Assistant Area Manager, Nigel Wells, said: “Simple things that seem the most obvious are by far the best ways to make sure all road users get home to their family; we want safe journeys not last journeys. “The wearing of seatbelts by ALL occupants of a car can save lives and serious injuries, yet amazingly, some families still don’t. We have had cases where the driver and front seat passenger were wearing seatbelts and survived a crash with minor injuries. Unfortunately, the people travelling in the back were not using seat belts and tragically lost their lives. “It is essential that all children have a seat belt on or are strapped into a suitable child seat before every journey begins; this should be done automatically. “The overcrowding of cars is also an issue. Children travelling on the lap of a parent or an adult in a car is simply not an acceptable way to keep them safe. In an accident the adult would be powerless to prevent that child being thrown around the car and suffering serious or even fatal injuries. A simple rule should be the number of seatbelts in the car is the maximum number of people travelling at one time. “Sadly, driving with any alcohol or drugs in your system can have a massive adverse effect on your ability to drive. Our advice is not to drink at all if you are driving, not even one. Driving whilst under the influence of alcohol or drugs not only puts your own life at risk, but risks the life of every other person on the road, including pedestrians. “Driving whilst distracted can also have catastrophic effects. Being on the phone, texting, checking emails, writing a facebook comment all only take a couple of seconds, but that couple of seconds can lead to disaster with life changing consequences for everyone involved in the crash. Despite massive increases in traffic over the last few decades, the number of people killed on our roads has fallen from around 5,500 per year in the mid-1980s to 1,754 in 2012. However, this still means that nearly five people die on Britain’s roads every day. More than 400 people are killed in crashes involving young car drivers aged 17 to 24 years, every year, including over 150 young drivers, 90 passengers and more than 170 other road users. Around 200 lives each year could be saved if everyone always wore their seat belt. Monday 16th December 2013 – 10.00am – Claire Brown. A community paramedic in Solihull was joined by a local MP this morning to witness, first hand, the life-saving work of the service. 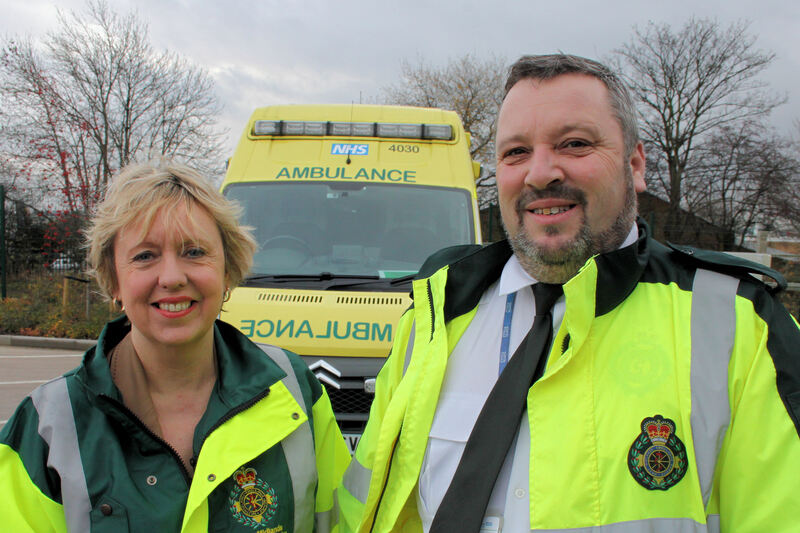 Liberal Democrat MP for Solihull, Lorely Burt, reported for duty at 7.00am to jump on board an ambulance response car with Shirley Community Paramedic Andy Parr. 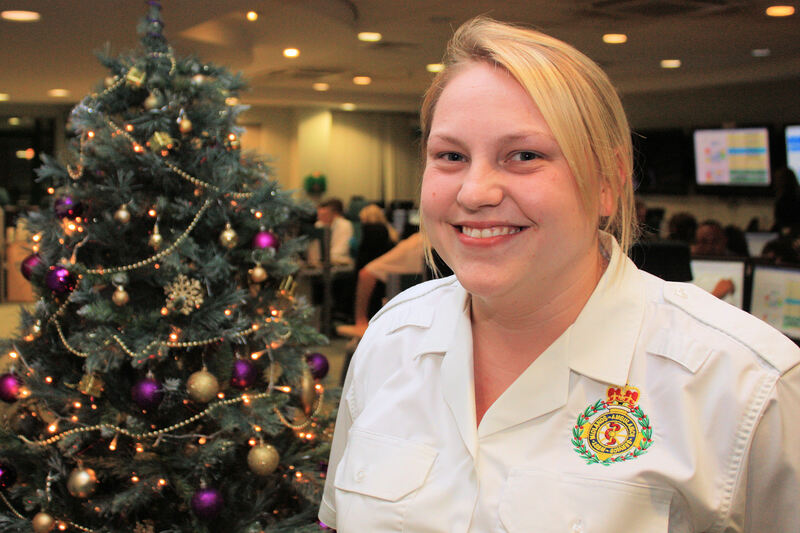 During her shift, Lorely had an insight into the life and work of an advanced paramedic by responding to two 999 calls; an elderly man with breathing difficulties and an elderly woman who had collapsed at home. 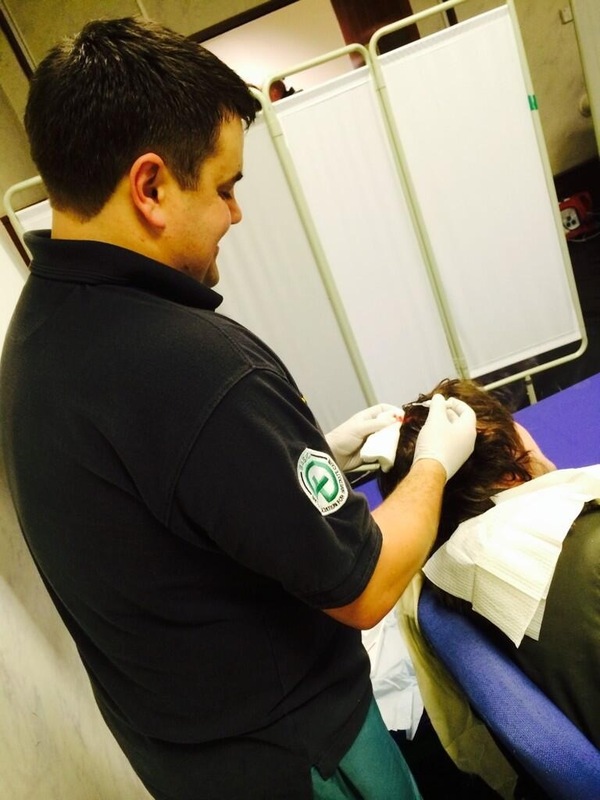 As well as witnessing Andy at work, Lorely had the chance to visit his base at the community ambulance station in Shirley, situated in a Sir Josiah Mason Trust’s sheltered accommodation complex on Green Lane. Lorely concluded her visit at the ‘Make Ready’ ambulance preparation and maintenance Hub in Erdington which became operational in September and marked the final phase of the project in Birmingham. This week the Trust took the decision to base double staffed emergency paramedic ambulances in some towns across the Region. Solihull will be one of those towns to benefit from this change. 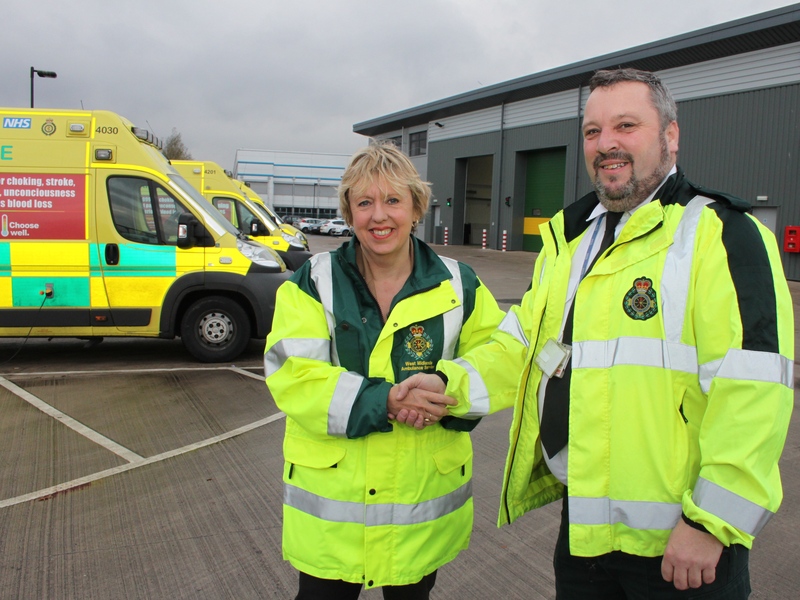 Talking about her visit, Lorely Burt said: “I’m immensely grateful to West Midlands Ambulance Service for a really illuminating and interesting morning with Andy, the advanced paramedic. Most of all I am delighted at the news that three two-crewed ambulances will now be stationed at Solihull, Shirley and Olton. After a six-month campaign involving people from local residents right up to the Prime Minister, we now have a much better ambulance service for people in Solihull. “But there is still work to be done, and some of the problems are beyond the control of the ambulance service. One of the things I have learned today is that many of the delays are caused by problems with the A&E at Heartlands Hospital. Nathan Hudson, the Trust’s General Manager for Birmingham, said: “It’s a pleasure to welcome MPs, such as Lorely, to see the inner workings of our ambulance service. “The life-saving work of our staff and the challenges they face are difficult to truly understand without witnessing it for yourself. I hope the observational shift that Lorely has undertaken today has helped to further strengthen her views on the fantastic work of our staff in providing a fast response and the right care to patients when they need it the most. Pictured: MP Lorely Burt with Dean Jenkins (Area Manager North Birmingham) outside the Trust’s Erdington Hub. All this week we will be out with ambulance staff,providing you with an insight into the range of calls that we get and how we respond to them.Follow us on twitter for more.. I work for the Courier Transport Service (CTS). I’m one of a team of 27 courier drivers who operate throughout the region. My workload is focused in Staffordshire and I am responsible for transporting medical equipment, records, prescriptions and clinical waste to and from GP surgeries within the County and the wider NHS. My last shift is on Christmas Eve and this will be the first Christmas in six years where I wont be working over the Christmas Period. My plans for Christmas day will be cooking dinner for the whole family and then I will be flying off and I will be spending New Year away on holiday. Almost everyone will get a cough or cold at some point this winter. When it’s your turn or someone in your family or a friend, you can play a vital role in reducing the chance of the germs spreading. Studies have shown that respiratory infections are reduced in groups who practice good hand and respiratory hygiene measures. This campaign is also likely to have a positive effect on other diseases such as Norovirus which leads to diarrhoea and vomiting. 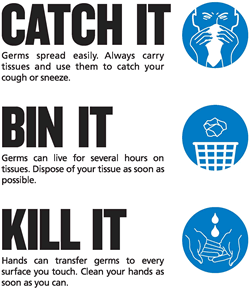 When you cough or sneeze, use a tissue, put it in the bin and wash your hands to stop the spread of germs. It really is that simple. If you don’t have access to hand washing facilities, use an alcohol gel to reduce the chance of germs spreading. Sadly there is nothing that the ambulance service, A&E or your GP can prescribe which will help you through your cough or cold; you just have to tough it out. However, you can use over the counter medicines, keep yourself hydrated and try and get plenty of rest.